2018. Are We Prepared for Nuclear Terrorism?. New England Journal of Medicine, Vol. 378, Issue. 25, p. 2447. Yeddanapudi, N. Clay, M. A. Durham, D. P. Hoffman, C. M. Homer, M. J. and Appler, J. M. 2018. Informing CONOPS and medical countermeasure deployment strategies after an improvised nuclear device detonation: the importance of delayed treatment efficacy data. International Journal of Radiation Biology, p. 1. Kearns, Randy D. Marcozzi, David E. Barry, Noran Rubinson, Lewis Hultman, Charles Scott and Rich, Preston B. 2017. Disaster Preparedness and Response for the Burn Mass Casualty Incident in the Twenty-first Century. Clinics in Plastic Surgery, Vol. 44, Issue. 3, p. 441. Coleman, C. Norman and Koerner, John F. 2016. Biodosimetry: Medicine, Science, and Systems to Support the Medical Decision-Maker Following a Large Scale Nuclear or Radiation Incident. Radiation Protection Dosimetry, Vol. 172, Issue. 1-3, p. 38. Chao, Nelson J. and Confer, Dennis L. 2016. Thomas’ Hematopoietic Cell Transplantation. p. 431. Bolduc, David L. Bünger, Rolf Moroni, Maria and Blakely, William F. 2016. MODELING H-ARS USING HEMATOLOGICAL PARAMETERS: A COMPARISON BETWEEN THE NON-HUMAN PRIMATE AND MINIPIG. Radiation Protection Dosimetry, Vol. 172, Issue. 1-3, p. 161. Kearns, Randy D. Hubble, Michael W. Lord, Graydon C. Holmes, James H. Cairns, Bruce A. and Helminiak, Clare 2016. Disaster Planning. Journal of Burn Care & Research, Vol. 37, Issue. 4, p. 197. Coleman, C. Norman Sullivan, Julie M. Bader, Judith L. Murrain-Hill, Paula Koerner, John F. Garrett, Andrew L. Weinstock, David M. Case, Cullen Hrdina, Chad Adams, Steven A. Whitcomb, Robert C. Graeden, Ellie Shankman, Robert Lant, Timothy Maidment, Bert W. and Hatchett, Richard C. 2015. Public Health and Medical Preparedness for a Nuclear Detonation. Health Physics, Vol. 108, Issue. 2, p. 149. Shimura, T. Yamaguchi, I. Terada, H. Robert Svendsen, E. and Kunugita, N. 2015. Public health activities for mitigation of radiation exposures and risk communication challenges after the Fukushima nuclear accident. Journal of Radiation Research, Vol. 56, Issue. 3, p. 422. Kearns, Randy D. Conlon, Kathe M. Valenta, Andrea L. Lord, Graydon C. Cairns, Charles B. Holmes, James H. Johnson, Daryhl D. Matherly, Annette F. Sawyer, Dalton Skarote, Mary Beth Siler, Sean M. Helminiak, RADM Clare and Cairns, Bruce A. 2014. Disaster Planning. Journal of Burn Care & Research, Vol. 35, Issue. 1, p. e1. Coleman, C. Norman 2013. Fukushima and the Future of Radiation Research. Radiation Research, Vol. 179, Issue. 1, p. 1. Coleman, C. Norman Hrdina, Chad Casagrande, Rocco Cliffer, Kenneth D. Mansoura, Monique K. Nystrom, Scott Hatchett, Richard Caro, J. Jaime Knebel, Ann R. Wallace, Katherine S. and Adams, Steven A. 2012. User-Managed Inventory: An Approach to Forward-Deployment of Urgently Needed Medical Countermeasures for Mass-Casualty and Terrorism Incidents. Disaster Medicine and Public Health Preparedness, Vol. 6, Issue. 04, p. 408. Coleman, C. Norman Adams, Steven Adrianopoli, Carl Ansari, Armin Bader, Judith L. Buddemeier, Brooke Caro, J. Jaime Casagrande, Rocco Case, Cullen Caspary, Kevin Chang, Arthur S. Chang, H. Florence Chao, Nelson Cliffer, Kenneth D. Confer, Dennis Deitchman, Scott DeRenzo, Evan G. Dobbs, Allen Dodgen, Daniel Donnelly, Elizabeth H. Gorman, Susan Grace, Marcy Beth Hatchett, Richard Hick, John L. Hrdina, Chad Jones, Robert Kane, Elleen Knebel, Ann Koerner, John F. Laffan, Alison M. Larson, Leon Livinski, Alicia MacKinney, John Maidment, Bert W. Manning, Ronald Marinissen, Maria J. Martin, Colleen Michael, Gretchen Miller, Charles W. Murrain-Hill, Paula Nemhauser, Jeffrey B. Norwood, Ann E. Nystrom, Scott Raheem, Murad Redlener, Irwin Sheehan, Kevin Simon, Steven L. Taylor, Tammy P. Toner, Eric Wallace, Katherine S. Weinstock, David M. Whitcomb, Robert C. Wieder, Jessica Wiley, Albert L. and Yeskey, Kevin 2012. Medical Planning and Response for a Nuclear Detonation: A Practical Guide. Biosecurity and Bioterrorism: Biodefense Strategy, Practice, and Science, Vol. 10, Issue. 4, p. 346. Li, C. Jourdain, J.-R. and Kramer, G. H. 2012. Improving global laboratory capabilities for emergency radionuclide bioassay. Radiation Protection Dosimetry, Vol. 151, Issue. 4, p. 626. Norman Coleman, C and Lurie, Nicole 2012. Emergency medical preparedness for radiological/nuclear incidents in the United States. Journal of Radiological Protection, Vol. 32, Issue. 1, p. N27. Knebel, Ann R. Coleman, C. Norman Cliffer, Kenneth D. Murrain-Hill, Paula McNally, Richard Oancea, Victor Jacobs, Jimmie Buddemeier, Brooke Hick, John L. Weinstock, David M. Hrdina, Chad M. Taylor, Tammy Matzo, Marianne Bader, Judith L. Livinski, Alicia A. Parker, Gerald and Yeskey, Kevin 2011. Allocation of Scarce Resources After a Nuclear Detonation: Setting the Context. Disaster Medicine and Public Health Preparedness, Vol. 5, Issue. S1, p. S20. Dodgen, Daniel Norwood, Ann E. Becker, Steven M. Perez, Jon T. and Hansen, Cynthia K. 2011. Social, Psychological, and Behavioral Responses to a Nuclear Detonation in a US City: Implications for Health Care Planning and Delivery. Disaster Medicine and Public Health Preparedness, Vol. 5, Issue. S1, p. S54. Dainiak, Nicholas Gent, Robert Nicolas Carr, Zhanat Schneider, Rita Bader, Judith Buglova, Elena Chao, Nelson Coleman, C. Norman Ganser, Arnold Gorin, Claude Hauer-Jensen, Martin Huff, L. Andrew Lillis-Hearne, Patricia Maekawa, Kazuhiko Nemhauser, Jeffrey Powles, Ray Schünemann, Holger Shapiro, Alla Stenke, Leif Valverde, Nelson Weinstock, David White, Douglas Albanese, Joseph and Meineke, Viktor 2011. Literature Review and Global Consensus on Management of Acute Radiation Syndrome Affecting Nonhematopoietic Organ Systems. Disaster Medicine and Public Health Preparedness, Vol. 5, Issue. 03, p. 183. 2011. Health Risks of Accidents at Nuclear Power Plants. New England Journal of Medicine, Vol. 365, Issue. 10, p. 962. Correspondence: Address correspondence and reprint requests to Dr C. Norman Coleman, Office of the Assistant Secretary for Preparedness and Response, US Department of Health and Human Services, 6130 Executive Blvd, Rockville, MD 20852 (e-mail: Norman.Coleman@nih.gov). 1.The Next Challenge in Healthcare Preparedness. Catastrophic Health Events.Baltimore, MD: Center for Biosecurity, University of Pittsburgh Medical Center; 2009. 2.Institute of Medicine. Guidance for Establishing Crisis Standards of Care for Use in Disaster Situations: A Letter Report.Washington, DC: National Academies of Science; 2009. 3.Kaji, A, Koenig, KL, Bey, T.Surge capacity for healthcare systems: a conceptual framework. Acad Emerg Med. 2006;13 (11):1157–1159. 4.Planning Guidance for Response to a Nuclear Detonation.2nd ed. Washington, DC; Homeland Security Council, Interagency Policy Coordination Subcommittee for Preparedness and Response to Radiological and Nuclear Threats; May 6, 2010. http://hps.org/hsc/documents/Planning_Guidance_for_Response_to_a_Nuclear_Detonation-2nd_Edition_FINAL.pdf. Accessed February 7, 2011. 5.Office of the Assistant Secretary for Preparedness and Response Web site. Accessed June 23, 2010. http://www.phe.gov/about/Pages/default.aspx. 6.Barbera, JA, Macintyre, AGMedical Surge Capacity and Capability Handbook: A Management System for Integrating Medical and Health Resources During Large-Scale Emergencies. http://www.phe.gov/Preparedness/planning/mscc/handbook/Documents/mscc080626.pdf. Published 2007. Accessed May 15, 2010. 7.Coleman, CN, Hrdina, C, Bader, JL.Medical response to a radiologic/nuclear event: integrated plan from the Office of the Assistant Secretary for Preparedness and Response, Department of Health and Human Services. Ann Emerg Med. 2009;53 (2):213–222. 8.Hrdina, CM, Coleman, CN, Bogucki, S.The “RTR” medical response system for nuclear and radiological mass-casualty incidents: a functional TRiage-TReatment-TRansport medical response model. Prehosp Disaster Med. 2009;24 (3):167–178. 9.National Institute of Allergy and Infectious Diseases, National Institutes of Health. Medical countermeasures against radiological and nuclear threats. http://www3.niaid.nih.gov/topics/radnuc. Accessed February 11, 2010. 10.Office of the Assistant Secretary for Preparedness and Response. Biomedical Advanced Research and Development Authority. http://www.hhs.gov/aspr/barda. Accessed May 6, 2010. 11.Military Medical Operations, Armed Forces Radiobiology Research Institute, US Department of Defense. Medical Management of Radiological Casualties Handbook.Bethesda, MD: Armed Forces Radiobiology Research Institute; 2003. 12.National Library of Medicine, National Institutes of Health. Radiation Emergency Medical Management. http://www.remm.nlm.gov. Accessed April 2, 2010. 13.Radiation Injury Treatment Network. Accessed February 14, 2010. http://www.nmdp.org/RITN/index.html. 14.DiCarlo, AL, Maher, C, Hick, JL.Radiation injury after a nuclear detonation: medical consequences and the need for scarce resources allocation. Disaster Med Public Health Prep. 2011;5(Suppl 1)S32–S44. 15.Knebel, AR, Coleman, CN, Cliffer, KD.Allocation of scarce resources after a nuclear detonation: setting the context. Disaster Med Public Health Prep. 2011;5(Suppl 1)S20–S31. 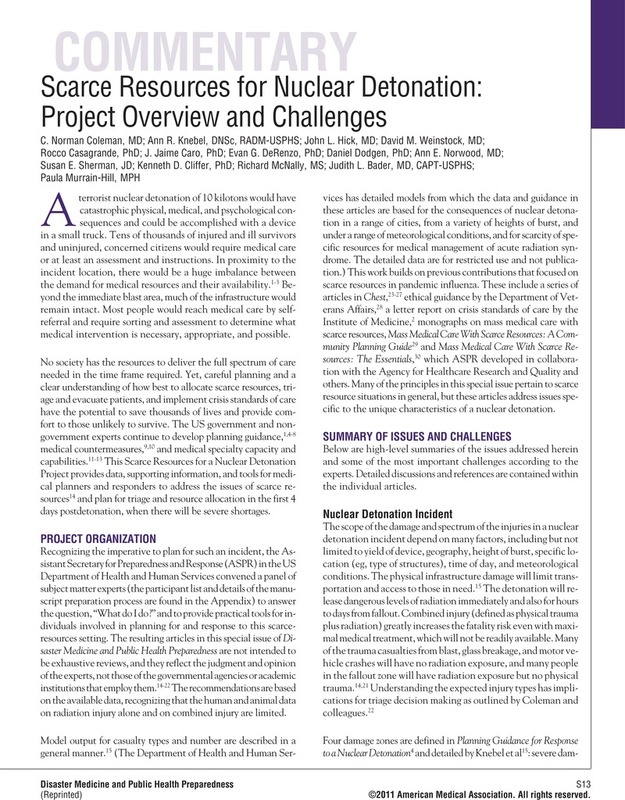 16.Hick, JL, Weinstock, DM, Coleman, CN.Health care system planning for and response to a nuclear detonation. Disaster Med Public Health Prep. 2011;5(Suppl 1)S73–S88. 17.Caro, JJ, DeRenzo, EG, Coleman, CN.Resource allocation after a nuclear detonation incident: unaltered standards of ethical decision making. Disaster Med Public Health Prep. 2011;5(Suppl 1)S46–S53. 18.Dodgen, D, Norwood, AE, Becker, SM.Social, psychological and behavioral responses to a nuclear detonation in a US city: implications for health care planning and delivery. Disaster Med Public Health Prep. 2011;5(Suppl 1)S54–S64. 19.Sherman, SE.Legal considerations in a nuclear detonation. Disaster Med Public Health Prep. 2011;5(Suppl 1)S65–S72. 20.Murrain-Hill, P, Coleman, CN, Hick, JL.Medical response to a nuclear detonation: creating a playbook for state and local planners and responders. Disaster Med Public Health Prep. 2011;5(Suppl 1)S89–S97. 21.Casagrande, R, Wills, N, Kramer, E.Using the model of resource and time-based triage (MORTT) to guide scarce resource allocation in the aftermath of a nuclear detonation. Disaster Med Public Health Prep. 2011;5(Suppl 1)S98–S110. 22.Coleman, CN, Weinstock, DM, Casagrande, R.Triage and treatment tools for use in a scarce resources-crisis standards of care setting after a nuclear detonation. Disaster Med Public Health Prep. 2011;5(Suppl 1)S111–S121. 23.Christian, MD, Devereaux, AV, Dichter, JR, Geiling, JA, Rubinson, L.Definitive care for the critically ill during a disaster: current capabilities and limitations: from a Task Force for Mass Critical Care summit meeting, January 26-27, 2007, Chicago, IL. Chest. 2008;133 5(Suppl)8S–17S. 24.Devereaux, A, Christian, MD, Dichter, JR, Geiling, JA, Rubinson, LTask Force for Mass Critical Care. Summary of suggestions from the task force for mass critical care summit, January 26-27, 2007. Chest. 2008;133 5(Suppl)1S–7S. 25.Devereaux, AV, Dichter, JR, Christian, MDTask Force for Mass Critical Care. Definitive care for the critically ill during a disaster: a framework for allocation of scarce resources in mass critical care: from a Task Force for Mass Critical Care summit meeting, January 26-27, 2007, Chicago, IL. Chest. 2008;133 5(Suppl)51S–66S. 26.Rubinson, L, Hick, JL, Curtis, JRTask Force for Mass Critical Care. Definitive care for the critically ill during a disaster: medical resources for surge capacity: from a Task Force for Mass Critical Care summit meeting, January 26-27, 2007, Chicago, IL. Chest. 2008;133 5(Suppl)32S–50S. 27.Rubinson, L, Hick, JL, Hanfling, DGTask Force for Mass Critical Care. Definitive care for the critically ill during a disaster: a framework for optimizing critical care surge capacity: from a Task Force for Mass Critical Care summit meeting, January 26-27, 2007, Chicago, IL. Chest. 2008;133 5(Suppl)18S–31S. 28.Veterans Health Administration Pandemic Ethics Initiative Work Group. Meeting the Challenge of Pandemic Influenza: Ethical Guidance for Leaders and Health Care Professionals in the Veterans Health Administration. http://www.ethics.va.gov/activities/pandemic_influenza_preparedness.asp. Published July 2010. Accessed August 1, 2010. 29.Agency for Healthcare Research and Quality. Mass Medical Care With Scarce Resources: A Community Planning Guide.AHRQ Publication No. 07-0001. http://www.ahrq.gov/research/mce. Published February 2007. Accessed June 23, 2010. 30.Agency for Healthcare Research and Quality. Medical Care With Scarce Resources: The Essentials.AHRQ Publication No. 09-0016. http://www.ahrq.gov/prep/mmcessentials. Published September 2009. Accessed June 23, 2010. 31.Lerner, EB, Schwartz, RB, Coule, PL.Mass casualty triage: an evaluation of the data and development of a proposed national guideline. Disaster Med Public Health Prep. 2008;2(Suppl 1)S25–S34. 32.Office of the Assistant Secretary for Preparedness and Response. National Disaster Medical System Web site. http://www.phe.gov/Preparedness/responders/ndms/Pages/default.aspx. Accessed June 23, 2010. 33.Centers for Disease Control and Prevention. Radiation Studies Branch Web site. http://www.cdc.gov/nceh/radiation. Accessed February 14, 2010.